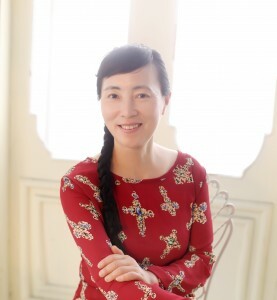 Most recognize Lin as the quiet, little lady with a sweet smile and jingle of a laugh. She jokes that few pronounce her name correctly, so she often becomes “Ling.” Born in Ma An Shan in the An Hui Province of China, Lin’s story traverses thousands of miles, and every smile she puts on symbolizes every obstacle she’s overcome. Here’s a little about Lin, as told by her daughter, Teresa, who nominated her to be a M.O.M. My mom says I was one of the happiest things that happened to her 21 years ago, but I am the fortunate one! Every single day mom made a trip to the local farmers market so I could have the freshest seafood broths. (She jokes that my swimming career manifested out of all the fresh seafood I ate as a baby.) In 1994, Lin gave up a competitive government career in China and moved to the United States with my dad to give me and my brother the best upbringing she could. She knew no English and didn’t have a single friend, but did have a sister here, which is why she chose Portland. Not a day has gone by when my mother didn’t wake up before me and have breakfast on the table. She never took a day off; if I was waking up at four in the morning for swim practice, my mother was up before me cooking me something nutritious. Not a birthday went by without a birthday cake or a full dinner table of my favorite foods. When I went to college, my mom sent me homemade carrot cake. When I told my mom the dining hall wasn’t providing me sufficient protein, she over-nighted steaks from Portland to New York. Well-prepared food was the love that never ceased to fill my home growing up. My mom is self-taught, and nothing posed too big a challenge. She sent me to school with sandwiches made on homemade bread with homemade jam. I grew up eating homemade moon-cakes on Chinese New Year, homemade fresh cranberry sauce on Thanksgiving, and every authentic Chinese dish from my mother’s childhood. Even after I was born, my mother never stopped giving me life through her food and cooking. I’ve never been able to do something like this for her, and she truly deserves to be the one taken care of for once in her life.